In April the order came down from above. The Chinese government told farmers across the country’s breadbasket region in the northeast that they had to grow more soybeans calling the order a political priority. However, in some areas of the region, the soybean fields remain empty as the spring has been very dry in Sandaogou a village in the Liaoning province. One farmer said there has been a drought this year, which resulted in soybeans being planted late and the seedlings should already be out at his point. More rain is needed added the farmer. The farmer would only give his first name due to fear of reprisal from local government authorities, as soy is now very political. China is the largest consumer in the world of soybeans, an important product for the making of things such as pig feed and oil, and is the biggest buyer of American beans. However, China placed higher tariffs on several items exported from the U.S. including soybeans, in retaliation for the new import tariffs placed by the White House on Chinese goods. Earlier this week, President Donald Trump ordered U.S. trade representatives to draft another new list of Chinese goods worth $200 billion that will now have duties, which was a sharp escalation to the trade fight between the two largest economies in the world. 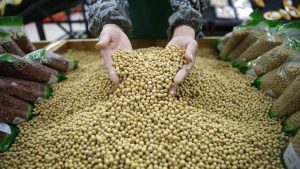 The agricultural ministry of China said in May that the country would lower its imports of soybeans for just the first time in over 15 years. As a way to make up for some of that loss, Beijing mandated that local authorities set aside more than 1.6 million acres for more soybeans. China already cultivates close to 21 million acres of soybeans. However, one farmer, who did not give her name, said that while she has soy beans growing on the collective farm where she works, she prefers growing corn on her own piece of land. She complained that yields of soybeans were low and risky while growing corn made for a steady income. In 2017, over 14.3 million metric tons of soybeans were produced by China. Another 100 million tons were imported to meet the local demand and a third of the imported soybeans came from the United States. An agricultural analyst said tariffs by the Chinese on soybeans imported from the U.S. will have an impact on both the Chinese and U.S. markets.